HAVe something robert-morton oriented to sell? This section is intended to be a sort of "bulletin board" where users can post items that they may have for sale. 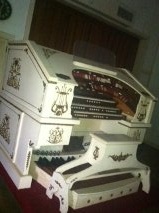 The rules are simple -- the item you wish to put up for sale must be related to the Robert Morton Organ Company. That might include Robert Morton pipe organ components, complete or partial Robert Morton organs, commercial recordings of Robert Morton organs, or Robert Morton memorabilia of any kind. The webmaster (that's me) has the final say on what is appropriate for the board and what is not. Posting is simple -- send me the copy you wish to use (a description of what you have), any pictures which depict the items, and a means for prospective buyers to contact you. I will leave your listing up for an extended length of time, unless you request its removal sooner, and there is no cost for this service. 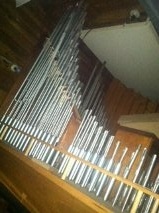 You can contact me with your listings at greg@risterpipeorgans.com. SPECIAL ALERT! The Robert Morton organ originally installed in the St. Francis Theatre (a rare early 3/16 instrument, installed in 1917, when the theatre was called the "Empress") in San Francisco is up for sale by a private owner. We will provide more details as we receive them. You can find a photo of the console while it was "in-theatre" in the Gallery section. 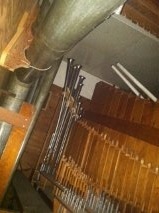 Various RM and non-RM for sale: http://virtual-pipes.com/new_page_2.htm, including former "dreadnought" console of the San Francisco Orpheum organ.